Oh man, this is going to be nuts. You know the deal. The Giants and Cowboys, teams equal in record and weeks removed from a nail-biting showdown in Dallas, will play an elimination game on Sunday in New York. The winner will qualify for the playoffs as the fourth seed. The loser will be eliminated and begin 2012 feeling quite sad. These are high stakes. As was mentioned yesterday, the Giants are hoping to get some injured guys back on the field for Sunday. Hakeem Nicks and Mario Manningham should both be in action, and Ahmad Bradshaw, back in practice today, remains available to play. 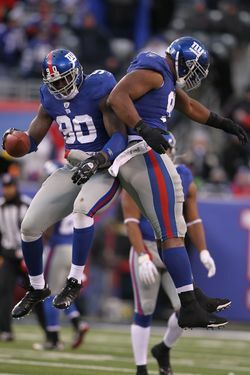 Most important, it sounds like Osi Umenyiora will indeed return to the defense. It'll be compelling to see how the Giants use their newfound surplus of defensive ends, with Umenyiora and Justin Tuck both healthy and Jason Pierre-Paul demanding some field time based on his performance when they weren't. The Giants' defense (well, at least the line) might actually be something close to fully formed for this game. That's pretty exciting, and should hopefully help New York give Tony Romo (and his injured hand) the same terrors that they gave him a few weeks back, and perhaps allow them to stifle the Cowboy's run game a bit more. Giants blog Big Blue View even wonders if we'll see some totally new blitz packages from defensive coordinator Perry Fewell. Whatever the case, this one's going to be bananas. These are two evenly matched, unpredictable clubs. Even this late in the season, it's impossible to know what to expect, except that we're all going to pee our pants. That much is certain.